What colours are people using to paint them? 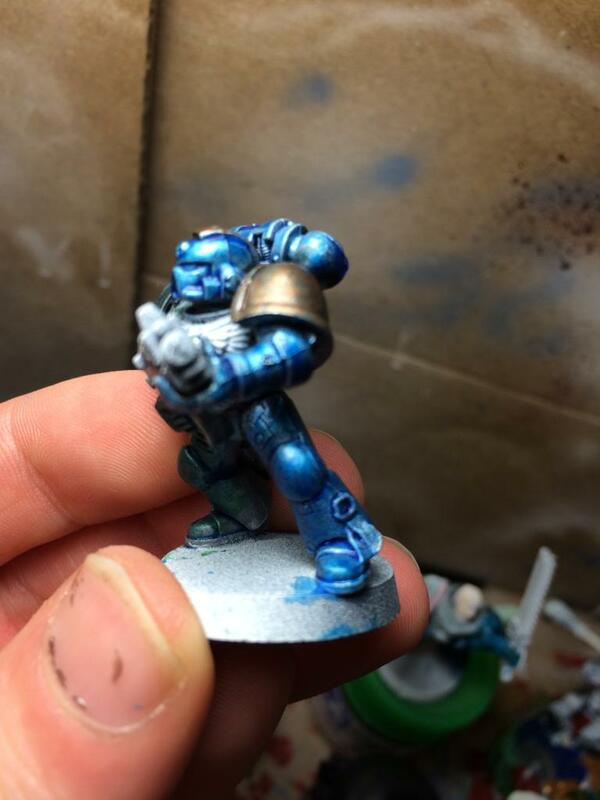 There is a forge world scheme put out that uses a mix Tamiya clear blue and green paints over a metallic base. 6. USING AN AIRBRUSH BLEND A HIGHLIGHT ON THE HIGHEST PANNELS (HEAD, SHOULDER PADS, TOP OF BACKPACK) WITH RUNEFANG STEEL WITH A TINY AMOUNT OF LOTHERN BLUE, EXTREMELY THINNED DOWN. 7. APPLY THINNED COAT OF TAMIYA CLEAR BLUE OVER THE HIGHLIGHT AND BLEND INTO THE SURROUNDING AREA. 8. 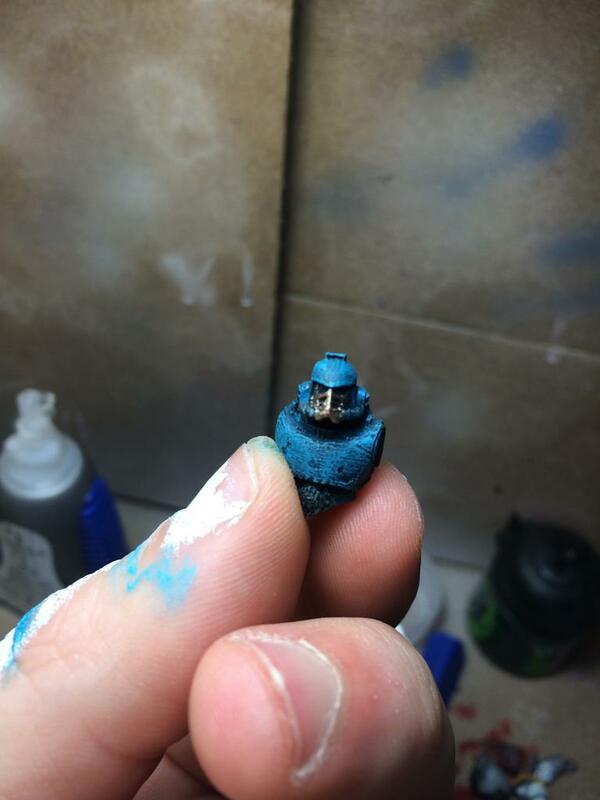 USING A BLUE GLAZE, DRAG DOWN THE WHOLE MODEL ALLOWING IT TO SETTLE IN THE DEEPEST AREAS. Edited by Vincec79, 21 April 2014 - 10:03 AM. Why does everything have to be airbrushed nowadays. If you do it right, it makes the armor look iridescent. seems like a lot of very impractical paint schemes for legion sized armies if you dont have an airbrush... do u have any pics excessus? Sure, here are six guys. Faction: XXth Legion, and others. Excessus; those guys look amazing and I may just have to steal that scheme! I've been wanting to do AL for sometime now and havn't had the right inspiration. Tried a few schemes out that went badly but this looks perfect! “Let my epitaph be this; I was born nameless and abandoned in the gutter of a sunless pit, but I have died a conqueror of worlds." Because it makes things so much easier and it produces much better results then you can achieve with a brush unless you want to spend hours and hours getting the same smooth transitions and blending that an airbrush lets you do in minutes. Serious airbrushes make painting armies so much faster and easier and it looks better then doing it by brush. Edited by Brother Khairon, 22 April 2014 - 11:12 PM. Maybe a little green wash? Looks like he's holding a lightsaber. Excessus your models look great and that looks like a nice simple and time efficient method when compared with some others I've read. Thanks, I will have to try it! Also leoparden your test figure looks superb; I prefer it to forgeworld's outcome though I think I lack the skill, patience and time to follow that method. Wow. That model is pretty awesome, Leoparden. I'd suggest spending a little money on some FW stuff, and crack out a squad of those dudes. It was the first time for me working with clear paints on top of metallics, the method was pretty easy to follow - I found it sounds more complicated then it actually was to apply if that makes sense. I'm also particularly fond of what that blue glaze layer does to the studs on the shoulder pad - that tiny blue halo effect is awesome. 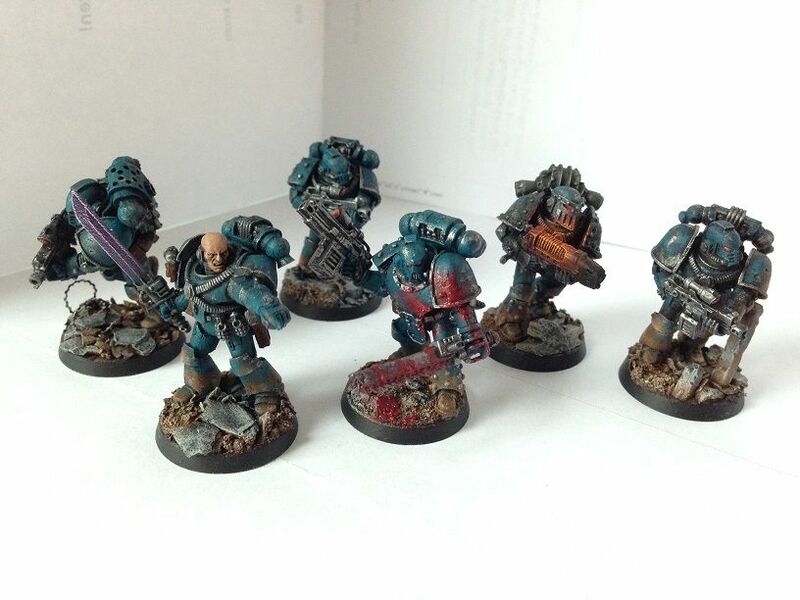 I already have a Mk III/IV Night Lords army in the works. 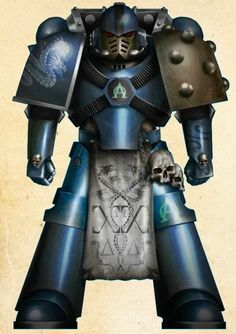 I'm planning on some Alphas but I want to use Mk VI for them because it's viable fluffwise and for variational purposes (also because I like the challenge of making them as similar as possible but still trying to get some individuality into the miniatures, which will be a radically different approach compared to my Night Lords). How long did it take to do that model? Or I suppose a better question is using the same method how long would you estimate a 10 man squad to take? Doing the first miniature was about a Saturdays worth of hobby time, but test models are always a bit iffy timewise. 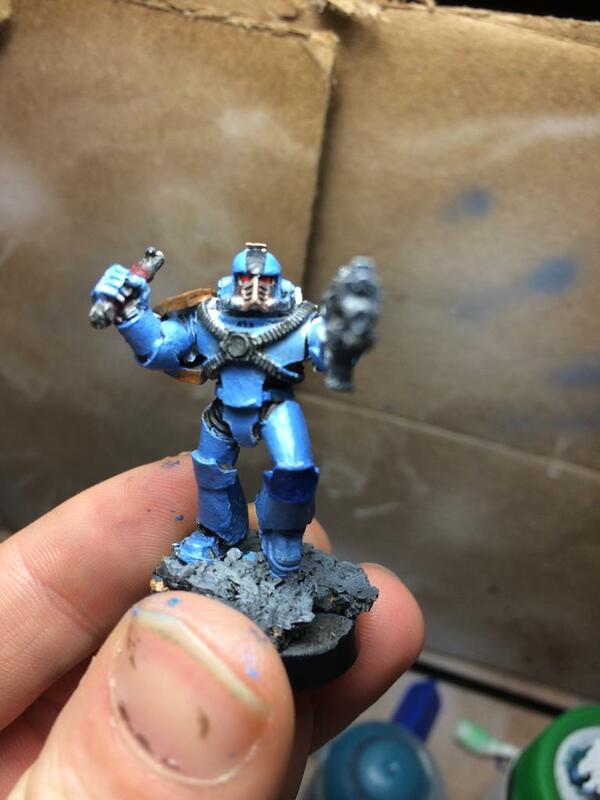 What I like about it is that I hardly have to do any highlighting (which I'm doing till death on my Night Lords). The limiting factor here is the brushwork on the bolters and the pigments on the base I'd say. The airbrushing would only takes minutes longer if you added more miniatures to the assembly line. You have to give Tamiya colours a tad longer between layers to dry completely (compared to GW acrylics). If I was to venture a guess on a 10-man squad at this level (no markings, no freehands and extra detailed fuss), maybe around 4-5 hours for the power armour and then at least the same amount of time for the brushwork + pigments. Leoparden, yours really is ace. >Wow. That model is pretty awesome, Leoparden. I'd suggest spending a little money on some FW stuff, and crack out a squad of those dudes. Can't wait for that thread to start, I've been watching your work over on Warseer for a while and I have to say you have the best Night Lords I've ever seen, everyone here who hasn't seen your work is in for a treat. @Leoparden How do you get your metallics on so smooth...i just tired clear over metallics for the first time and mine look splotchy and like they're not covering the whole surface. It's all in the airbrush I would assume because I'm not doing anything special as far as I know. Thinning the paints thoroughly helps as does doing multiple super thin layers instead of one thicker. This appears to be specially true to Tamiya Clear Paints. I'd hate to admit it, but part of the awesomeness in my miniatures is from how I take my pictures also (ie my ramshackle photobooth).